The perfect blend of savory and sweetness. 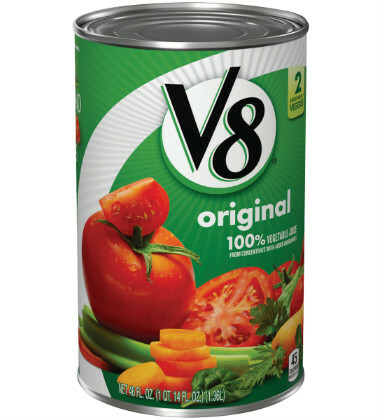 V8 Vegetable Juice brings out the heartiness of the ground beef while pineapples add a whole new dimension to the finished flavor! 1. Drain pineapple, reserving syrup. Reserve pineapple. 2. In bowl, whisk together reserved pineapple syrup with 1 1/4 cups vegetable juice and cornstarch. Hold. CCP: Refrigerate below 40°F. 85% lean ground beef	 2 lb. egg, large, beaten	 2 ea. black pepper, ground	 1 tsp. 3. In a large bowl, mix thoroughly remaining vegetable juice, beef, bread crumbs, eggs, garlic and pepper. Shape firmly into 48 (1) balls. 4. Heat oil in large skillet over medium-high heat; add meatballs, 12 at a time, and cook until evenly browned. Remove meatballs as they brown and drain. CCP: Heat to an internal temperature of 165°F. or higher for 15 seconds. CCP: Hold hot at 140°F or higher for service. 5. Pour reserved cornstarch mixture into hot skillet and heat, whisking constantly, until mixture boils and thickens. Return meatballs to skillet. Add reserved pineapple and cook over low heat 5 minutes or until meatballs are heated through. CCP: Heat until internal temperature is 165°F. or higher for 15 seconds. CCP: Hold at 140°F. or higher. 6. To Serve: Serve in chafing dish with food picks to serve, 2 meatballs per serving.